This year, Rae and I anticipate we’ll be traveling a lot as we screen and promote Autumn Gem across the country. Because of this, it will be critical for us to have Internet access wherever we go and whenever we need it. Over the past twelve years, I’ve had periods where I had the ability to access the Internet on the run. Initially, it was through the Metricom Ricochet wireless modem. The Ricochet was great because I could hook it up to my PowerBook or Newton and have 56Kbps or 128Kbps access to the Net way back in 1998! Later, I used the Palm VII for quick wireless access from the palm of my hand. The downside to the Palm VII was that you didn’t have full access to the Internet, only access to scaled down Web Clipping applications from select content providers. A few years later, I tried tethering my Sony Ericsson T68i to my laptop, but the speed was very slow. Today, I can use my iPhone to do pretty much all the basic Internet tasks that I require on a daily basis: email and web browsing. If AT&T were to offer a tethering option, I would consider it, but I probably wouldn’t like the slow Edge speeds and the short battery life that would invariably follow. With that in mind, I’ve been looking for a solution to getting persistent access to the Internet while on the road. From Ziv, I’ve learned of a number of people using the Cradlepoint CTR-350 EVDO/Wi-Fi router ($139) and the Verizon USB727 EVDO modem (free with 2-year service contract). Alex has been using this solution (with Sprint EVDO) successfully since the end of 2007. I picked up these two components along with a BixNet 5V Li-ION battery ($80). This allows me to use share my EVDO Internet connection over Wi-Fi for up to 8 hours on a single battery charge. So, instead of having my EVDO modem connected only to my laptop, I share the Internet connection through Wi-Fi, meaning my MacBook Pro, iPhone, and iPod touch can access the Internet at the same time at EVDO speeds. As the title of this post suggests, I can also bestow the gift of the Internet to other people. With an Eye-Fi wireless memory card, I can use this setup to automatically upload photos from my digital camera to my SmugMug account. I wanted to use this at Macworld 2009, but the battery had not come in yet and the keynote room did not have any AC outlets. I ended up manually uploading selected photos to SmugMug for use on John’s live blog posts of the keynote. 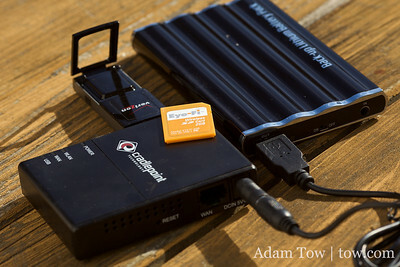 I wonder how many photojournalists are using something like this to transmit their photos while on the job. It seems like an excellent way to get photos immediately to the photo editor, provided that the images are small enough. I don’t think I want to try transmitting 21MP images, even if they are JPEG compressed! Update April 11, 2009: I had a problem with my initial Bixnet battery where the USB cable had to be wiggled in order to provide proper power to the router. I RMA’ed the battery, but I’m not sure if the battery is supplying the router with enough power. At several recent shoots, I’ve noticed that photos were not being uploaded either (1) in a timely fashion or (2) not at all. I’ve got an order in for another battery, the Tekkeon 3450i, which is approved for use with the Cradlepoint CTR-350. The Tekkeon is bigger and heavier than the Bixnet battery, but if it’s more reliable, it’s a better deal. I’d rather have something that works and is heavier than something that only works intermittently. I’ll provide an update when I have tested the Tekkeon. Stay tuned! Update April 19, 2009 The new BixNet battery does not appear to supply enough current to continually power the Cradlepoint and USB EVDO modem. The connection comes and goes, making the combination useless. BixNet has been selling an “updated” version of the battery, one with a mini-USB port for charging the battery. This version does not come with an on-off switch. On the other hand, the Tekkeon 3450i battery seems to work well. It’s much bigger, heavier, and pricier than the BixNet. I’ve updated the photos to show a side-by-side comparison of the two batteries. Another downside to the Tekkeon is that it has a huge AC adapter for charging the battery. I really like how the BixNet can be charged with virtually any USB AC adapter like my iPhone charger. Previous What Is Palm Nova? sounds like a pretty cool solution. i’ve always wanted internet everywhere, but haven’t really needed it yet. this sounds like a pretty good reason to make the investment, i’m sure it will be invaluable as you move around the country! Right now, Comcast is experiencing a cable Internet disruption. Guess what just came to the rescue? I really enjoyed reading this article, especially the blast-from-the-past modems you were talking about. I get my wireless access from a company in my home city of Portland called Clear wireless internet (www.clear.com). They have city wide wireless that’s affordable, and you can buy a day pass for $10, and they’re moving into other cities soon (Atlanta, Grand Rapids, Las Vegas). I see a lot of major cities moving towards city-wide wifi access, which I think is great. Even my sister in Vermont says that they’re talking about state wide access! Did you know that Metricom and Linksys also jointly released a router with a PCMCIA slot, which would accept a Merlin for Ricochet modem and share the Ricochet connection with a LAN? Telling of its time, it didn’t even have a wifi radio internally, but it was stackable with other Linksys products and was commonly paired with a WAP11. Strap those two together with a short cable between them and a battery on the bottom, and you’re all set! As for the present: I’ve been using a laptop to share my EVDO over a local wifi cloud. Consider installing Gallery on the laptop and letting the Eye-Fi upload into the Gallery, which will generate thumbnails and stuff. Then let your editor hit the gallery (most EVDO service plans do accept incoming connections, but you might have to run httpd on a port other than 80) from remote, preferably through a caching proxy. (Better yet, run the caching proxy in colocation and hand that out as the public address for your traveling gallery.) So each thumbnail is only pulled over the EVDO once and cached, and when your editor or someone else clicks through for a medium-res pic, it again gets served over the EVDO and cached. By default the medium and high res images sit on your laptop in the Gallery and never even move across the link until someone requests them. Then when you get home, plug in and rsync the whole mess, to save the high res images away from your laptop. If you’ve got a USB EVDO modem, you don’t even need a laptop with a CardBus or ExpressCard slot, which means the little micro laptops like the EEE would work for this. The only caveat is that you need a wifi card that can be put into hostAP mode, because the (braindead!) Eye-Fi can’t work with AdHoc networks. I had often thought of something like this as well – however, I wondered how long it would take to upload the images. 10MB jpgs that you can take 100 in a few minutes without trying – would take forever to upload over the mobile broad band. * I don’t know of many cameras that shoot 10MB Jog’s. Sorry. My D300 shoots 4, maybe 5MB images if I crank the resolution to the highest, and the JPG quality to the best quality. * If I’m shooting in real-time, and I want people to see my images, I crank the size way down and the resolution way-down. I know that I’m not going to print 12*18 prints from these photos, and immediacy is more important to me, than shooting 12MP images. So I shoot 2MP images at a lower JPG quality which are still phenomenal in quality.